Where there is war there is legend. And where there are the misty mountains there is romance. Time to take off from the real issues of life to tell a story of bravery and romance. There was a handsome soldier of the Indian army (they are always handsome in these stories) belonging to the Rajputana Rifles. His name was Jaswant Singh and he was posted in Arunachal along with his battalion around 1962. Two beautiful damsels with cheeks like roses (they are always beautiful in these stories), and who were sisters, set their lovely eyes on him one fine morning. They were local Arunachali girls and their names were Sheila and Noorie. They fell in love with him instantly! The jawan however was not convinced. But the two decided to wean their way into his heart. Every day they used to bring roti and sabzi, the jawan’s favourite food, for they had heard that the best way to a man’s heart is through his stomach. And slowly but surely the jawan fell in love with both of them. Every evening he used to spend time with them along the bank of the stream that flowed through the village. One day while he was doing this he saw all the men in his battalion running away for their lives. He and the sisters could not know why. All his comrades ran away. And then he saw hundreds of Chinese soldiers coming. He immediately readied his rifle and took cover. The sisters followed him with the ammunition. With the sisters filling his magazine again and again he kept on firing from a concealed position. He killed some 56 Chinese this way. The Chinese commander sent 12 men on a detour behind him and they succeeded in capturing him alive. He was hanged by telephone wires and the two sisters tortured to death. His head was cut off after he died. After the war he was found missing and the army decided to initiate a court martial against him.The general who was in charge of the trail however saw Jaswant in a dream at night. He was in full military regalia. He directed him to ask the truth to the Chinese. The general enquired to the Chinese side and sure enough- the true story came out. Ever since then he is known as Baba Jaswant Singh. A temple has been built in his honour. He is given posthumous promotions every few years. 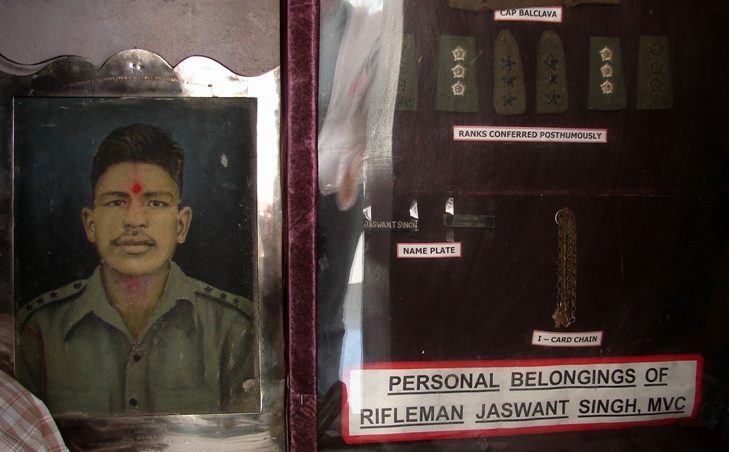 Last heard this simple rifleman was a Lieutnant General of the Indian army. Every army man going to duty in the high mountains pays homage to Baba before going into the high mountains, by praying in his temple. Even Muslim soldiers of the Indian army dont dare go forward without offering namaaz in the temple. Few years ago a major general scoffed at this as superstitions and went ahead without praying at the Baba’s temple. His helicopter crashed to death in the high Himalayas. People believe that the Baba goes every night on patrol in the mountains. Every night new clothes are ironed and kept in the Baba’s temple before the doors are closed. Next day they are crumpled! The Baba has worn them on his patrol in the mountains. Soldiers of the army who are sleeping are liable to be whacked into alertness by the big stick that Baba reportedly carries. The temple has become a major centre for pilgrimage for the common people of Arunachal, as well as a major tourist attraction. The common people believe that the next time the Chinese army attacks them, Baba will swoop down the mountains to mow down the enemy.Even if the Indian army ever abandons them, the Baba never will. He is their ultimate defence against the almighty power of China, the hordes of the middle kingdom and the firepower of the dragon. Hopeful stories maybe. But where there is hope, there is life . Note: The story is based on hearsay accounts.